I have been fortunate this week to have the ability to work remotely as I spend time with my wife and my youngest son. We left on Sunday and headed to the loveliest little village on the plains, also known as Auburn, Alabama to visit with our son and spend some time away from home. After a few days in Auburn we headed all the way to the Gulf Coast and have been in Gulf Shores, Alabama since Tuesday afternoon. It is good to get away from the traditional office occasionally and that is the subject of today’s post. Let’s talk just a little about how technology has changed the way that many of us can get work done. I’ll use some personal examples as we do this. 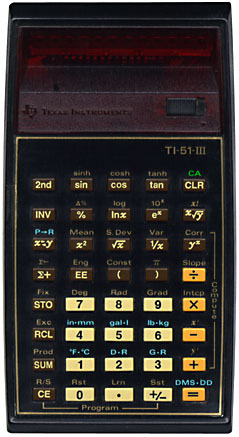 In comparison, I have as much computational capability in my phone (even saying phone is a misnomer) as I did in that TI (Texas Instruments) calculator. Not only can I communicate with my clients using my laptop with the proliferation of wi-fi, but I can also keep in touch using my new iPhone 4s (just gave up the Blackberry, sorry RIM). The whole concept of programming (development) has changed and open source has changed the way that things get done. I kind of touched on cell phones earlier, but I have to laugh when someone now says they want to fax something to me. I tell them that I do not fax, but I can scan and send anything they might need. Work gets done so much differently today and many of those who make decisions for the workplace still have their minds set in the 1981 timeframe I described when I graduated from Murray State with my degree in engineering physics. The days when everyone needed to be in the same room, let alone the same building or the same city, to get work done is now over. There is no doubt that people still need to meet face to face to make some decisions, but they day of everyone being “together” are over. Technology allows us to work from just about anywhere we want. I have this discussion with many of my clients and those who get it are the ones who have the best ability to acquire the talent they need for both today and tomorrow. Getting someone to pick up their family and move from one part of the country to another is not as easy as it once was and we now have a situation where firms want people to move, but they do not want to pay the costs to make this move happen. Some people say life’s a beach; I say that work’s a beach, so why not go to the beach and get something done. Getting out of your normal workplace can be very freeing and encourage creativity so find a way to get away from the norm and enjoy your life and your work. It can happen.